The Middle School humanities program inspires a love of history, geography, culture, literature, poetry, and drama while cultivating independent thinkers and writers. The program focuses on the interrelated experiences of reading and responding to literature, composing creative and expository pieces, and thinking critically. The humanities classes feature interdisciplinary curricula in which students apply theories and concepts. Teachers incorporate history, geography, and language arts to explore a central theme, topic, or experience. Through studying archaeology, sociology, economics, and political science, students hone critical-thinking and communication skills. Fifth grade explores themes of individuality, community, and culture through various projects and pieces of literature. Students examine how communities and cultures form and change, including research on historical and current social movements. How does geography and geology help shape culture? How are cultural beliefs represented? How and why do cultures change over time? What are the ethical considerations researchers must make? This study prepares them for their culminating Southwest trip to Crow Canyon Archeological Center in Cortez, Colorado, where students interact with the incredible civilization that arose in the Mesa Verde region. Sixth-grade humanities covers American history from the formation of the colonies through themes of the Jeffersonian ideals of life, liberty, and the pursuit of happiness. Through research, debate, public speaking, and examination of primary and secondary sources, students understand how the country developed socially, economically, politically, and geographically. They learn how the US became a world power amid struggles of reconstruction, industrialization, and wars. In one example project, sixth graders create their own bills for Congress as they study the workings of government in preparation for their culminating trip to Washington, D.C. In the fall, the seventh- and eighth-grade humanities curriculum alternates each year between themes of globalization and the Silk Road. 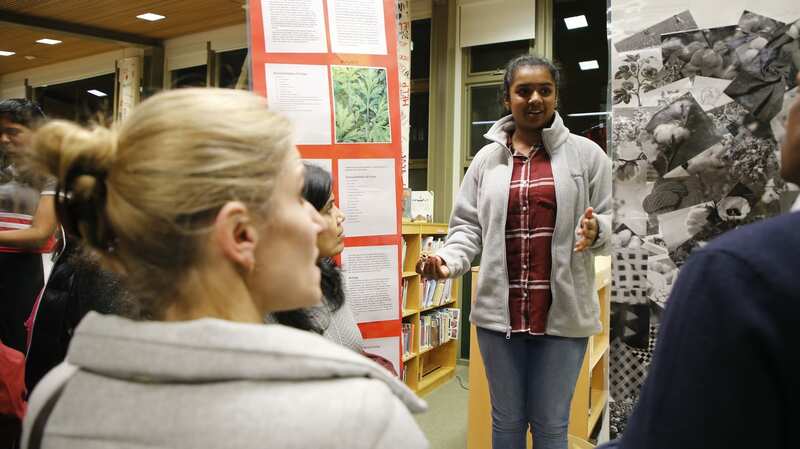 Through inquiry and authentic research projects that span multiple disciplines, students develop their understanding of how connected the world they live in has become. Seeing how the world is connected leads to the question of how the world became connected and they unravel this story through document-based inquiry that reveals the periods of exploration, colonialism, and imperialism that shaped the modern world. The culmination of their studies is the commodities research project. Rather than becoming experts in an individual country or historical narrative, students think globally. They choose an important trade commodity and explore world history through the lens of this commodity. From chocolate to gold to ivory to tobacco, students develop a deep understanding of trade, economics, culture, politics, history, and more, through an intensive, interdisciplinary research project that they present at Nueva’s World’s Fair Culmination. The Silk Road curriculum sets students on an immersive journey across 7,000 miles and more than 2,500 years. It exemplifies Nueva’s commitment to interdisciplinary learning, as humanities, science, and writing are intertwined. Students’ experience is unified: from class to class, they examine the Silk Road from a new point of view, in ways both broad and deep. Students are guided by key pillars of geography, economics, and belief systems that thrived and clashed along the complex networks of land and water routes from Japan to Italy, and they examine these pillars during three influential moments in history: the time of Alexander the Great, the Tang Dynasty, and the Mongolian era. In addition, essential questions such as “How does geography affect history?” and “How has trade shaped humans?” help them construct understanding as they grapple with questions of resources, conflicts, ethnicity, and national identity that are still so alive in the world today. Students research historic figures, read selected works from then and now, and embark on deep studies of species that thrived along the Silk Road. They are exposed to cultures beyond the world they live in, and in the process have learned how to read for information, analyze, synthesize, and apply knowledge. Through a mix of individual and group projects, they demonstrate their learning in the form of multimedia presentations, map making, artwork, essays, and infographics. In a Nueva tradition, students bring their study to life through a bold and beautiful Silk Road Bazaar.